The Da Vinci BodyBoard system combines strength training and cardio in one short, daily workout system. The system works for any fitness level and can be used as a rehab system for injuries. The system is designed to build long, lean, muscles and does not tear the muscle. As a result, it can be used daily. This facilitates a more habit-forming exercise regime. Because of the short time commitment, there are no excuses. The BodyBoard also reaches the smaller muscles that support your joints creating a body with a more complete and balanced muscle structure. You’ll never want to put off a Da Vinci BodyBoard workout. Its an effective workout system that builds strength and cardio fitness, AND it fits into a busy lifestyle, so it’s something you will look forward to in your daily routine. I’ve partnered with the giveaway host, Comeback Momma to present you this amazing giveaway. 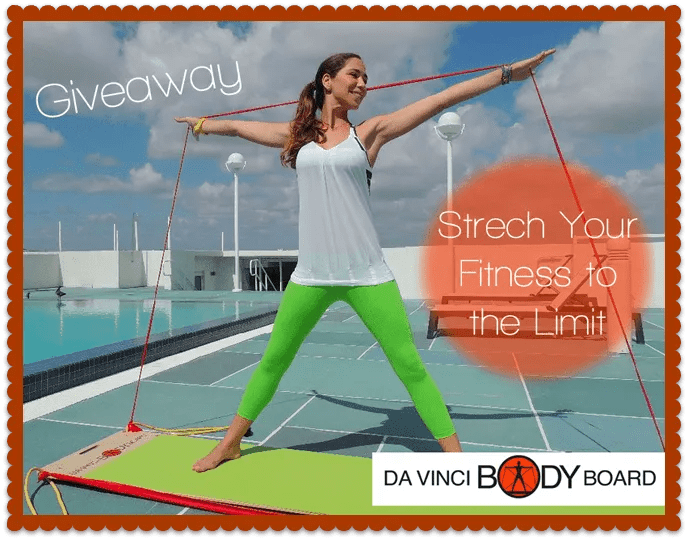 Check out her review of the Da Vinci Body Board, it looks pretty awesome!!! I have never heard about this DaVinci Body System and I would love to try this. If this system is designed to build long, lean, muscles and does not tear the muscle then definitely this is perfect for me. Looks like a fun workout.